A grilled cheese sandwich with creamy havarti and sharp cheddar set off by grainy mustard and apple fig chutney. You get by with a little help from your friends. This was probably as true when the Beatles sang it as it is today. Interactions with my friends--either online or in person--give me physical and emotional support that keeps me going some days. I don't need much--a phone call here, a morning walk there, meeting for coffee or lunch--or chatting late at night on FB. It all lifts me up and makes me appreciate my friends. When my spouse is deployed my friends help me get through. At this stage of the game, it's less about physical support--though my friend Dawn's spouse's weekly weed whacking is an act of kindness I will never forget*--but the need for emotional support remains strong. I hope I give back to my friends as much as I take from them. 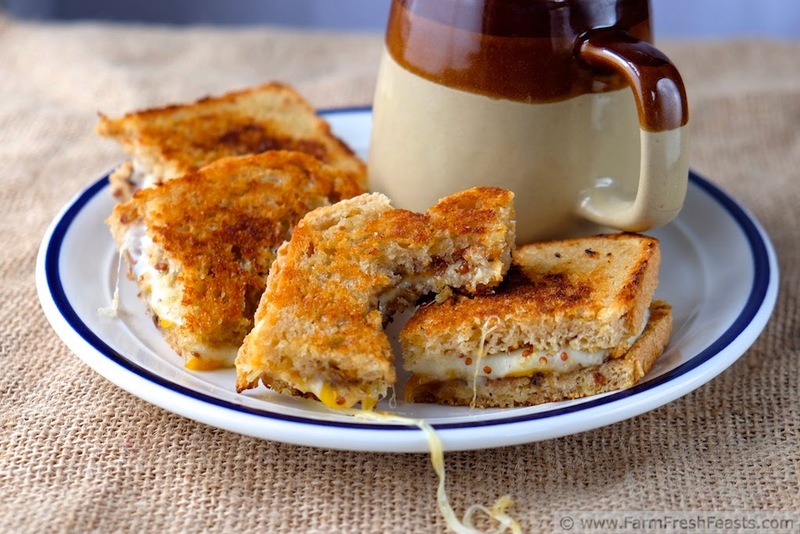 I'm writing about friends and grilled cheese because the idea for this recipe came via my friend Melanie. To know her is to know she's a rockstar ninja. A group of us were enjoying lunch to celebrate her birthday and I ordered grilled cheese. [My interpretation of that will appear on the blog in another week or two--my friends voted to share this one first.] Melanie told me about a great grilled cheese sandwich she'd had--havarti, mango chutney, and fresh spinach leaves. It sounded good enough for me to pick up a package of havarti slices at Costco and try it out with my Apple Fig Chutney for my girl. *If you are in a position to provide routine lawn care to a woman whose spouse is deployed--please do so. Don't wait for her to ask, just offer and then show up and do it. Thank you. Preheat a skillet over medium heat. 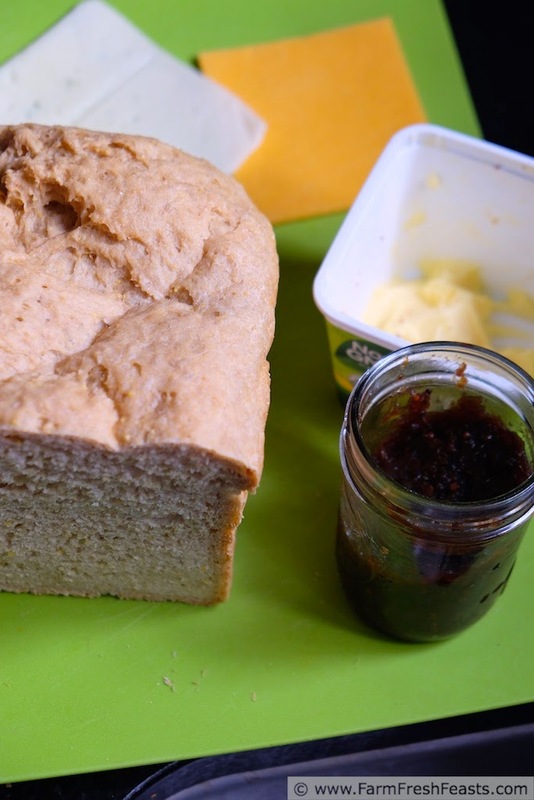 Spread 1 slice of bread with chutney and the other with mustard. 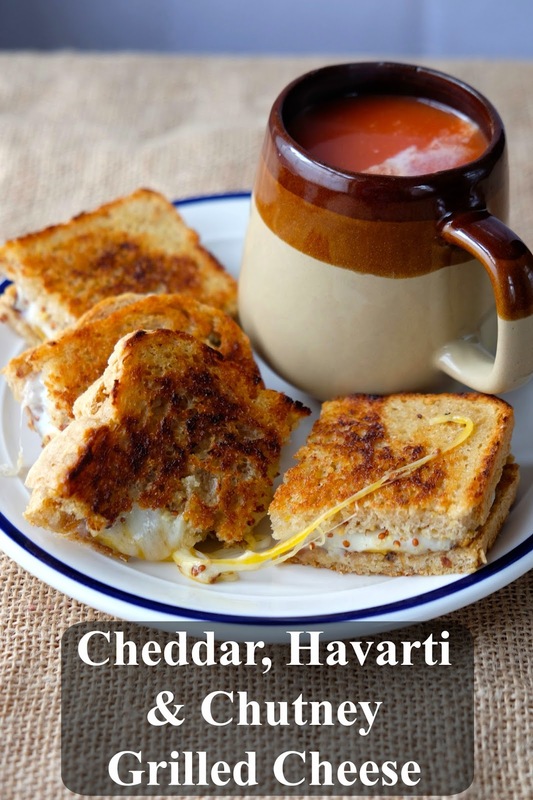 Top the chutney with havarti and the mustard with cheddar. If including spinach, tuck the leaves on top of one of the slices of cheese. 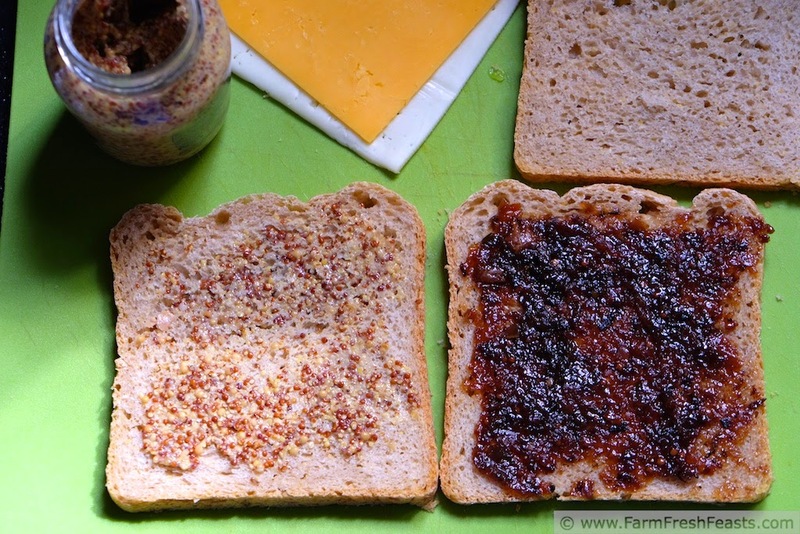 Flip one slice of bread over onto the other, so the cheese touch, and spread buttery spread across the bread. Place buttered side down in skillet and cook for 3 to 5 minutes until the bread is browned and releases easily. Spread buttery spread on the new top of the sandwich. Flip and cook the freshly-buttered sandwich another 2 to 4 minutes until the bread is browned and releases easily. 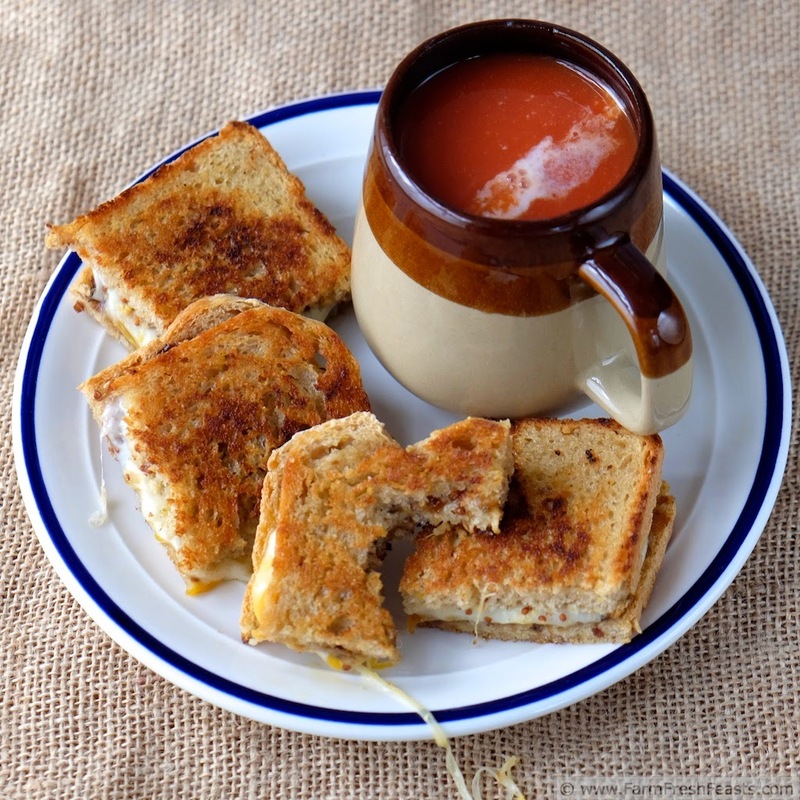 Tastes delicious with my Creamy Tomato Soup with Home-canned Tomatoes. 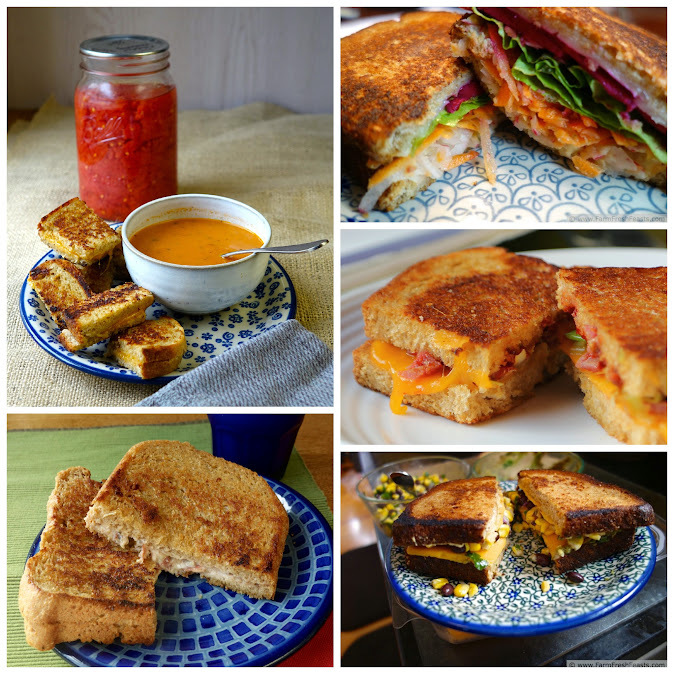 For other grilled cheese ideas, please click on a photo, it's one of my Clickable Collages of Recipe Ideas! Happy Grilled Cheese Month my friend. I remember when the Hubby was going through his stuff, one neighbor came over and cleaned out the flower beds and the other snow blowed the driveway most of that winter. To this day, I am still touched by their kindness. Also in both scenarios, we didn't ask for help and they didn't offer. They just came over and did it. It was wonderful. 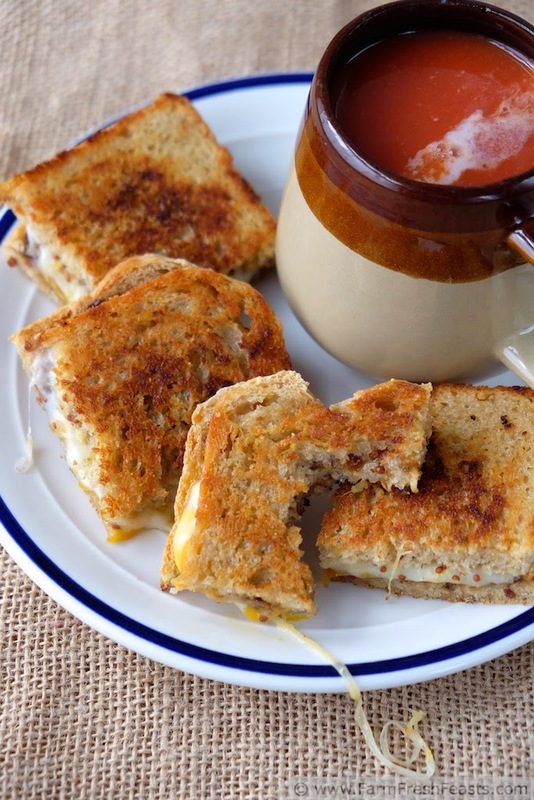 Speaking of wonderful, this grilled cheese looks killer. I love the concept and collusion of flavors. Well done. It just warms your heart, acts of kindness. Oh my, this sounds wonderful! Never thought about adding the chutney. When you have an open jar of chutney staring you in the face, and no plans to make Indian food any time soon . . . . creativity rears up and slaps a sandwich upside your head.